Hampton & Richmond Borough were well beaten on their own patch by an impressive Cray Wanderers side. After the midweek victory over Leiston FC saw them progress to the first round of the FA Trophy, I among with most of the other home fans were looking forward to seeing the team continue their assault on the top of the Ryman Premier League. What we saw, however, was a demoralising defeat that has taken me two full days to get over. There were two changes to the Hampton side from that midweek Trophy success; Darren Powell returned from injury to replace Anson Cousins, and Gary Holloway returned from suspension to replace Tom Hickey, who himself now starts a five game ban for a second red card of the season. The opening quarter of an hour saw very little in the way of goalscoring chances, Charlie Moone got to a cross but could only head it up into the air, while at the other end the impressive Danny Phillips was causing problems for the home defence. And indeed it was through Phillips that the visitors’ opener came. Darren Powell conceded a freekick thirty yards out, which Phillips curled into the box. Rodney Chiweshe only parried the ball out to the penalty spot and Leigh Bremner was on hand to put the ball away. It would be another fifteen minutes before anything of note happened. A corner from Neil Jenkins found Max Hustwick, and the defender headed powerfully at goal, only to see his effort cleared off the line. In the melee that ensued, the ball again came to Hustwick, but this time his shot was blocked. 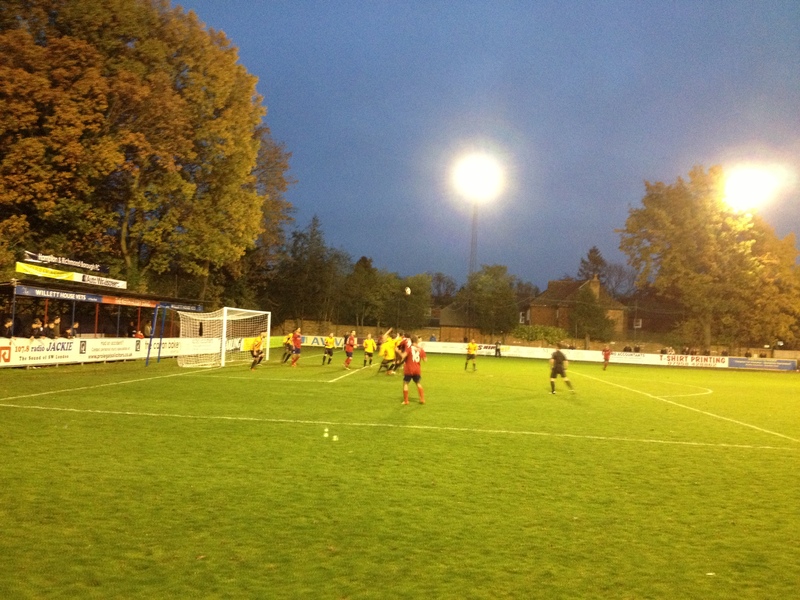 Hampton did equalise on the half hour, though, through an excellent move. Malvin Kamara surged forward before passing to the impressive young midfielder Joe Turner. He in turn slipped the ball through to Charlie Moone, who fired the ball past Cray keeper Andy Walker at his near post. It was Moone’s sixth league goal of the season, and his fourteenth in total. It was also his fourth strike in the last three games, seeing him regain his goal-den touch after a month long dry spell in front of goal. Borough started the second half looking for their second equaliser, and could have had it four minutes into the second period when Ledgister drilled a low cross into the six yard box, only for Walker to get down to claim the ball before Mo Bettamer could get a touch. On 52 minutes, the most controversial decision of the match denied Hampton an equaliser. Darren Powell headed home from a corner, but the officials somewhat harshly adjudged there to have been a foul, and the goal was chalked off. This seemed to totally derail the Beavers, and almost immediately could have found themselves two goals behind but for an excellent save by Chiweshe. Vines unleashed a thunderbolt that Chiweshe managed to tip onto the cross bar and out for a corner. Unfortunately, from that corner, Aaron Day headed home the visitors’ third goal, and effectively killed off the home side’s challenge. Cray then settled down and were much the better side for the remainder of the match. Chiweshe was again called into action, saving brilliantly from a Vines header, and other than half chances for Moone and James Simmonds, Hampton created very little. And so the match finished 1-3 to the visitors. It was a deserved victory for them, although it could have been different if Powell’s goal had stood. Having said that, I never felt confident that Hampton would get anything from the game, and as I said at the beginning of this report, it has taken two days to get over the defeat. I am now back on track, however, and looking forward to the upcoming FA Trophy first round tie with Conference South side Chelmsford City. 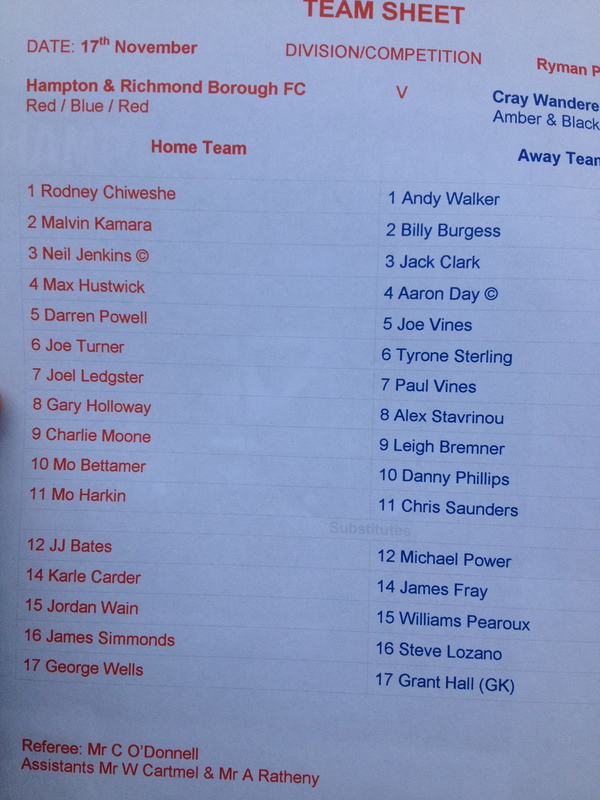 Posted on November 20, 2012, in UTL Archive and tagged Aaron Day, Charlie Moone, Cray Wanderers, Hampton & Richmond Borough, Isthmian League, Isthmian Premier, Leigh Bremner, Paul Vines. Bookmark the permalink. 1 Comment.